Can ethics be taught? That question was hotly debated among ethicists and other experts several years ago. And centuries prior, Socrates said that ethics could indeed be taught. Nevertheless, it appears that we’re still struggling to teach the subject in a way that’s engaging enough to stick with our students throughout their business careers. Moreover—and this isn’t helping—business schools have given the topic relatively short shrift during a time when arguably we’ve needed it most. “In order to be effective, ethics will need to be fully integrated into business curricula rather than offered as simply a stand-alone special assignment or as part of a discussion day,” says Danny Lanier, Jr., an assistant professor of accounting at Elon University in Elon, N.C. In fact, according to a 2008 study conducted by the Aspen Institute Center for Business Education titled “Where Will They Lead?” master of business administration (MBA) students reported feeling less confident that their business school training was preparing them to manage conflicts as they progressed through their career. Today we’re at a crossroads in ethics education as we continue to search for ways to ensure that ethics content is impactful. 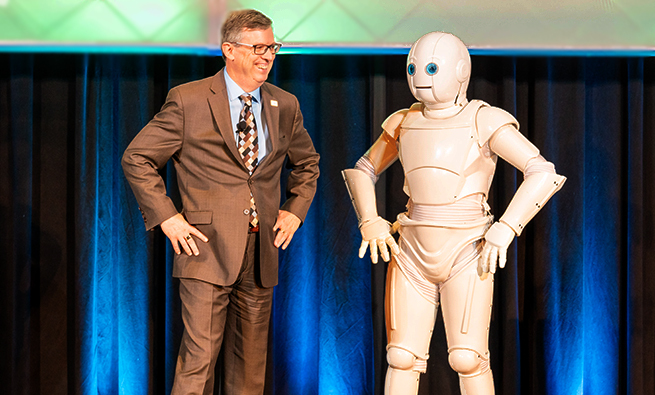 Technological advancements have introduced new pedagogical approaches to ethics instruction, but many business school professors and continuing professional education (CPE) providers seem hesitant to adopt these new approaches. For education and training to be effective, there must be a willingness to adopt trends to build the solid ethical decision-making skills that current and future business leaders need. These trends include adopting a multimedia learning approach, integrating digital badging, promoting social learning, and incorporating microlearning platforms. To put a twist on an old saying, if a picture is worth a thousand words, then a video is worth a million. Video is a powerful medium for conveying information. A report published in 2012 by three British researchers indicated that video in the classroom can increase student engagement in addition to developing deeper learning of the subject matter. If we want to ensure ethical lessons will stick, we need to be certain to use methods that are long-lasting. Many professors still rely on traditional lecture-based, text-heavy PowerPoint presentations that lack an interactive component. Sandi Mann, senior psychology lecturer at the University of Central Lancashire in England, discovered that 60% of students find their lectures “boring” because of improper use of PowerPoint slides. What is “improper”? Quite frankly, when we use PowerPoint slides, we tend to prepare too many slides, incorporate too much information, and speed through the lecture faster than the learner can retain the information. If this has been your teaching or presenting style, it’s time for a change. Thankfully, new resources are entering the education marketplace that are disrupting the status quo and are more appealing to Millennials (defined as those in their late teens to early 30s). The company I founded three years ago, Helios Digital Learning, has introduced a suite of customizable and off-the-shelf products for academic institutions, corporations, professional educators, and government entities. Our primary products are video “e-cases” that are delivered digitally via desktop and mobile devices, as well as offered as on-site training. The e-cases are first-person, real stories told by white-collar felons, fraud victims, whistleblowers, and business leaders that are compelling, engaging, and informative. (The subjects volunteer their time.) Our clients include Virginia Tech, Boston University, Wake Forest University, the University of Washington, and Loyola University, to name a few. Timely. Rather than rehashing old case studies, e-cases present the stories of current-day white-collar felons, whistleblowers, business ethicists, and other experts. Tailored. 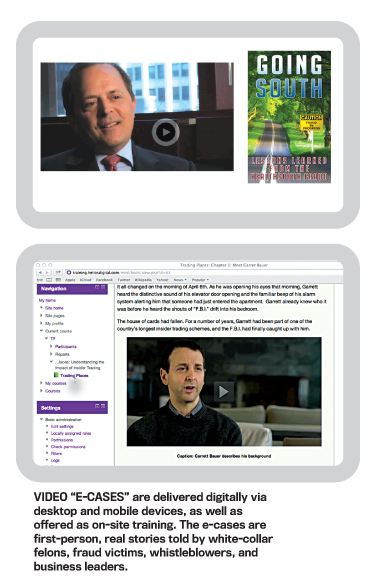 The learning modules can fit easily into existing curricula and training programs or spur new learning tracts on emerging ethics, fraud, and compliance issues. True. First-person accounts educate professionals and students on the impacts of the decisions that result in ordinary people committing extraordinary crimes. As Hinson has indicated, learning is an ongoing process that takes place both inside and outside the classroom. But how is the out-of-classroom learning being recognized? Digital badging can work well in ethics education because ethics can be acquired organically outside the classroom, and sometimes unconventional methods are the most effective ones for retention. Research has shown that the least effective courses force-feed principles-based ethics theory to students as a way of improving their moral reasoning. Unfortunately, many business ethics courses are still taught based on this outdated, one-directional (professor-to-student), pedagogical approach. Because of the flexibility of badging, the badge issuer—schools, employers, and individuals, among others—can determine which activities constitute rewarding a badge. For example, a series of interactive cases, such as e-cases or a playlist of TED Talks, is a unique way to introduce “digital-badge-worthy” content into the classroom or a corporate training program. 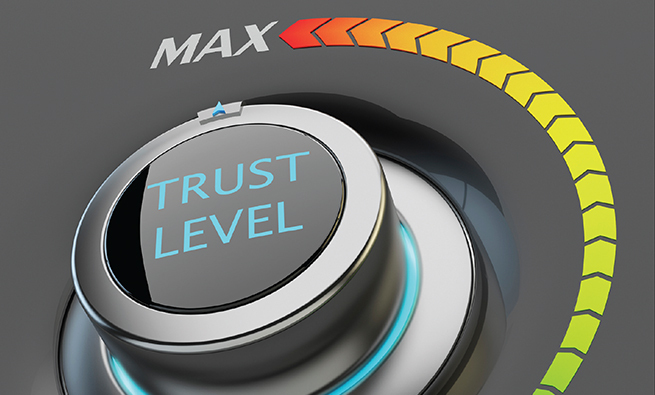 Business school administrators can agree on the content that constitutes a digital badge, or they can use content developed by a third party. 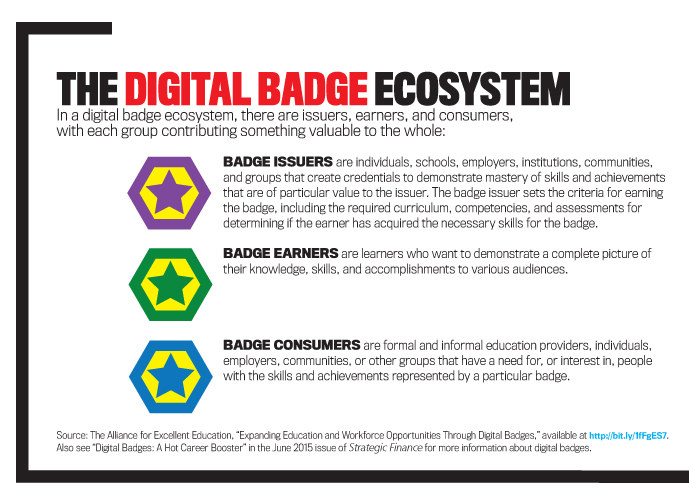 Overall, what makes digital badges work is that learners are rewarded for acquiring knowledge in a nontraditional fashion. As David Ohreen, philosophy professor at Mount Royal University in Calgary, Canada, discussed in 2012, most businesspeople don’t engage in the kind of abstract reasoning found in business ethics classes because of organizational pressures and the need for practicality. (For more, see Ohreen’s “‘Water Cooler Ethics’: A New Approach to Business Ethics Education,” Business Ethics, July 2012, http://bit.ly/1fJVBxL.) Therefore, it’s important to introduce real-world scenarios through digital “storytelling” in which students can quickly see the personal application. Uri Hasson, a Princeton University professor of psychology, indicates that a story is the only way to activate parts in the brain so that listeners turn the story into their own idea and experience. Having students view an ethical dilemma in a storytelling format is therefore critical to their future decision making when faced with an ethical dilemma. Peer discussion—student-to-student rather than teacher-to-student interaction—can have an even greater effect on changes in moral reasoning. Additionally, moral learning occurs primarily in unstructured social environments rather than formal courses or programs. Ohreen argues that a “water cooler ethics” approach is much more impactful than the pedagogical model used in many of today’s business ethics courses. A water cooler approach mimics a peer-to-peer or student-to-student model and has a significant effect on future actions. Indeed, research reveals that coworkers have a huge impact on new employees’ ethical behavior toward customers, competitors, and the firm as well as with regard to their evaluations of unethical actions. Given that Millennial learners are digital natives, we need to incorporate teaching resources that allow for social learning. Whether that’s using Twitter in class, blogging, or online discussion boards, educators need to offer a platform in which students can share their thoughts easily. Some scholars suggest that interaction in an online environment promotes student-centered learning, encourages wider participation, and produces more in-depth and reasoned discussions than a traditional classroom setting does. Online learning also allows students to share information after-hours, in an environment that’s less intimidating and without the pressures of a face-to-face setting. As such, discussing ethical issues in an online environment can often feel safer and more welcoming. Smartphones, tablets, and iPhone watches have forever altered the way we consume information. 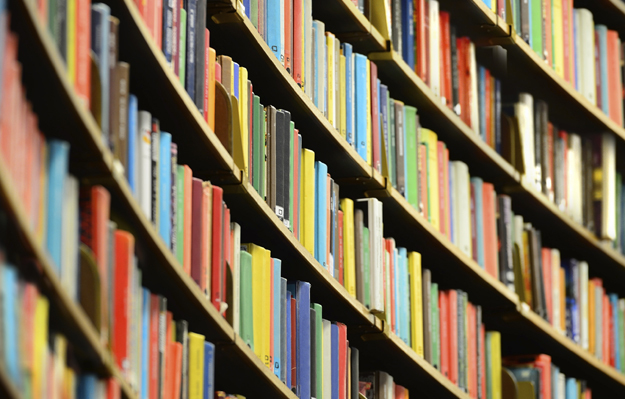 Gone are the days when you have to surround yourself with a stack of books to acquire a new skill. 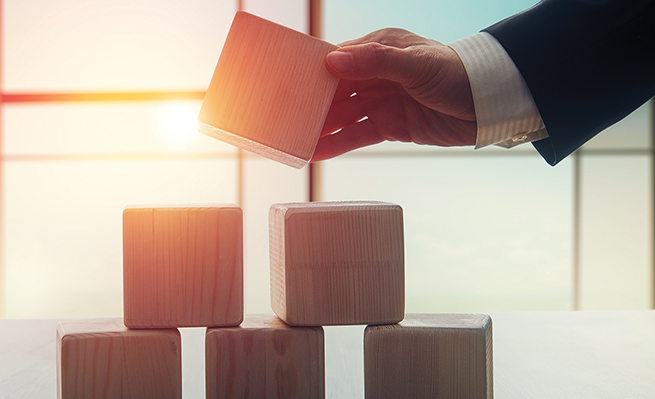 In today’s fast-paced learning environment, acquiring knowledge through microlearning—defined as learning small nuggets of content with rapid feedback—can be ideal. The concept hinges on immediate feedback to the learner. Learning can be consumed and knowledge can be acquired on the go: at the bus stop, at the gym, or even while standing in line at the grocery store. In other words, students and professionals can learn via “digital sipping,” which means information can be accessible electronically via small segments. One organization that has mastered “digital sipping” is TED, with its expansive library of online videos. The main reason for TED’s success is that, by design, it breaks down learning into small, easily digestible chunks. 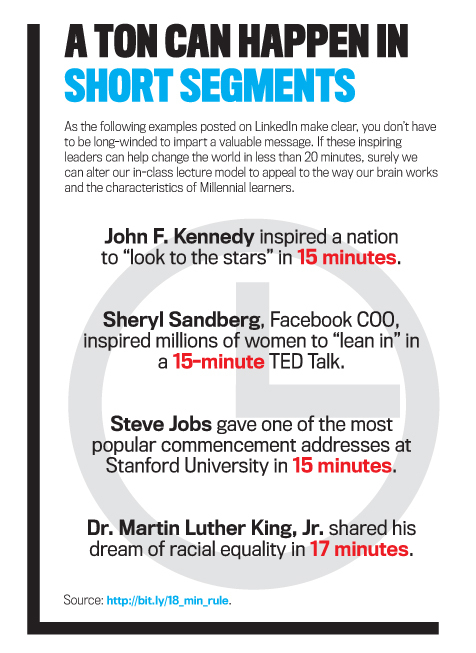 (The average TED Talk is just 18 minutes long.) As the brain takes in new information and is forced to process it, the brain works extremely hard and burns a significant amount of energy. Researchers at Texas Christian University are finding that the act of listening can be as equally draining as thinking hard about a subject; therefore, we need to take this into account when designing an ethics curriculum. Paul King, professor at the Bob Schieffer College of Communication at TCU, found that graduate students recall more information when they go to class three days a week for 50 minutes instead of one day a week for three hours! Although most students say they’d prefer to go to class once a week, they retain more information when receiving it in shorter amounts of time. 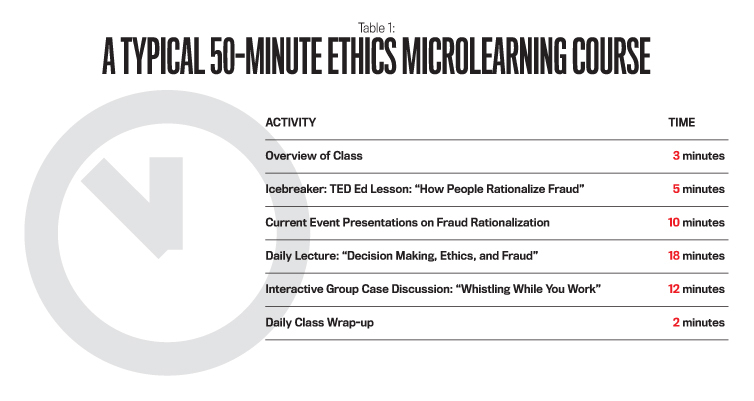 Microlearning platforms such as TED can easily be incorporated into a business ethics curriculum. 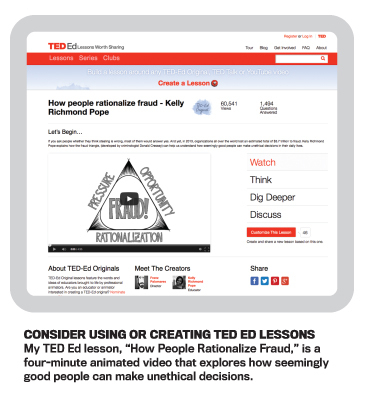 I recently produced a TED Ed lesson titled “How People Rationalize Fraud,” a four-minute animated video that explores how seemingly good people can make unethical decisions. The TED Ed website (http://ed.ted.com/lessons) is an excellent resource for short animations that can be incorporated into business ethics courses to stimulate in-class or online discussions. Additional TED Ed lessons that I’ve used in my classes are “How to Spot a Counterfeit Bill” and “The Language of Lying.” Professors can customize a lesson around TED Ed videos, allowing students to access this content outside the classroom and gain valuable knowledge privately. Later they can discuss what they learned during a class meeting. We have a multitude of learning resources at our fingertips, but it’s up to the educator to incorporate them into the business ethics classroom effectively. Today’s ethics education should seek to surprise, delight, and reward the learner. 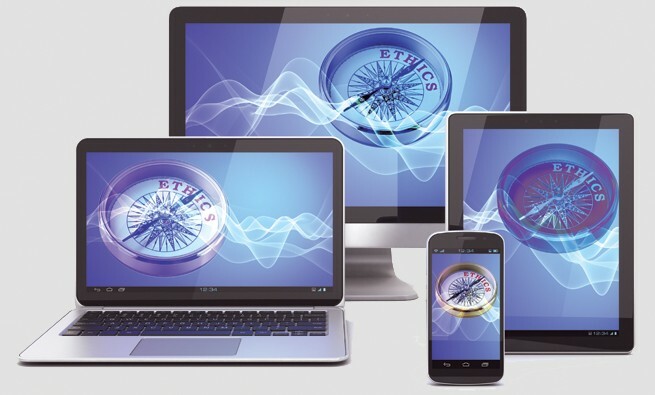 New approaches, such as multimedia learning, digital badging, and microlearning, are innovative methods that can greatly enhance ethics education in business schools. But instructors need to be interested in and open to utilizing these new technologies to enhance learning. As I’ve seen over the past several years as we’ve begun to migrate away from traditional forms of learning, if students retain the principles of ethics education more effectively and with greater enthusiasm, we all stand to benefit in the long run. Kelly Richmond Pope, Ph.D., CPA, is the founder and chief content officer of Helios Digital Learning, a Chicago-based education and training media production company, and an associate professor in the School of Accountancy and Management Information Systems at DePaul University. You can reach her at (919) 672-9697 or kelly@heliosdigital.com.